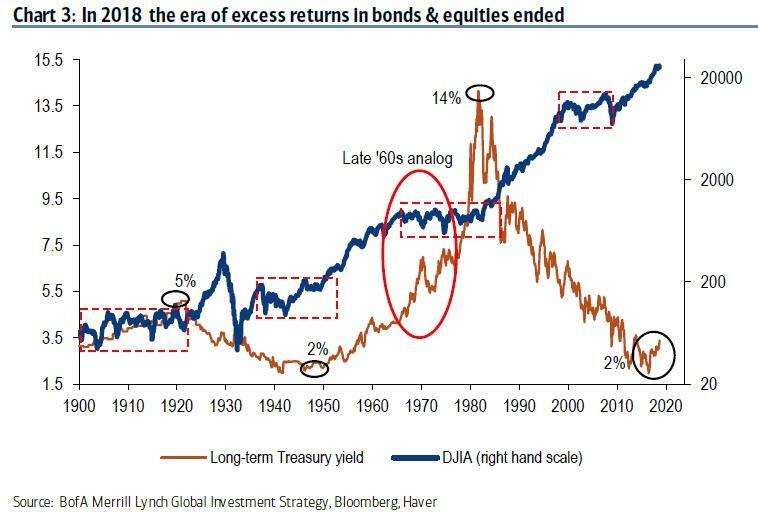 While not quite as bearish as Morgan Stanley which last week downgraded US stocks to a Sell, in its year ahead outlook for markets and the economy in 2019, Bank of America writes that "the long bull market cycle of excess stock and bond returns is expected to finally wind down next year, but not before one last hurrah." In short, just like Gartman, the bank is covering all bases being both bearish (near-term), bullish (medium-term) and again bearish to close the year, predicting a "baby bear" market in the early part of 2019, or as Michael Hartnett called it - "big lows" - two weeks ago, before rebounding and rising as high as 3,000 before and closing the year around 2,900, officially a decline from the bank's 2018 year-end forecast of 3,000.
whether a strong U.S. economy decoupled from the rest of the world, particularly Europe and China, can be sustained. The answer to that question could depend on big wild card risks in 2019: resolution of the trade war between China and the U.S., an EU political/economic crisis, and political gridlock in the U.S. that could slow capital investments and deteriorate investor sentiment. 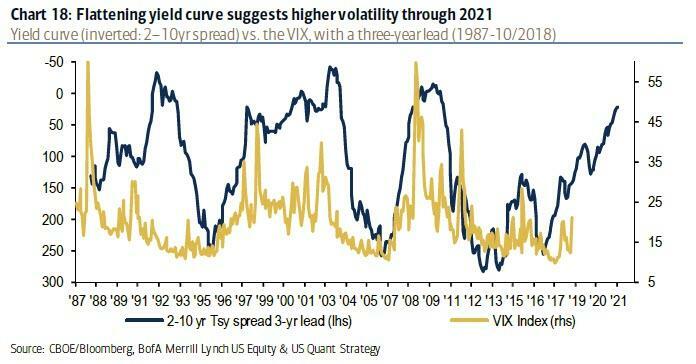 Credit cycle continues despite widening spreads and flattening curves: Globally, the credit markets face high levels of episodic volatility in 2019 with shrinking supply and quantitative tightening putting 25 to 50 basis points of upward pressure on investment grade and high-yield bond spreads. 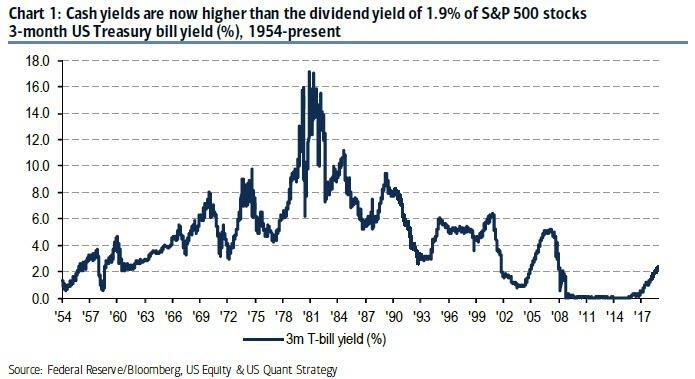 In the U.S., total returns of 1.42 percent are forecast for high-grade corporate bonds and 2.4 percent for high yield. The U.S.-leveraged loan market remains a bright spot in the credit spectrum, with total returns of between 4 and 5 percent. High-grade and high-yield corporate credit are expected to deliver total returns of 1 percent in Europe and, in Asia, 3 percent and 4.9 percent, respectively. Emerging markets: After a major sell-off in 2018, emerging market assets are cheap and under-owned and could be a big winner in 2019 as the dollar weakens, yet EM remains highly vulnerable to spillover effects of U.S.-China trade tensions. We are bullish Brazil and expect its post-election rally to continue, and Russia is expected to improve as we believe sanction risk is priced in. Meanwhile, the outlook is bearish for Mexico, where credit rating downgrades are a concern and volatility surrounds policy changes under its new president. Foreign exchange volatility on a weaker dollar: The U.S. dollar was the best performing asset class in 2018, however, most of the dollar gains appear to be in the past. 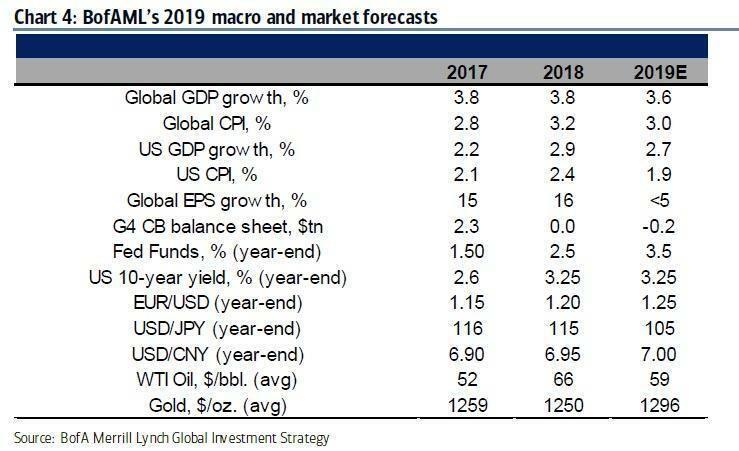 A weaker dollar is expected in 2019, against a stronger euro and Japanese yen. We forecast the EUR/USD and USD/JPY to reach 1.25 and 105, respectively at year-end. The strength of the dollar will depend heavily on evolution of the trade relationship between China and the U.S., which in the short term may mean selling the dollar against a currency insulated from trade war rhetoric, such as the British pound and Swiss franc. Commodities modestly positive: The outlook for commodities is modestly positive despite a challenging global macro environment. We forecast Brent and WTI crude oil prices to average $70 and $59 per barrel, respectively in 2019; weather-induced volatility is expected in the near term for U.S. natural gas, as cold weather could propel winter natural gas over $5/MMbtu, yet we remain bearish longer term on strong supply growth. In metals, we remain cautious about copper because of Chinese downside risk. We forecast gold prices will rise to an average of $1,296 per ounce, but could rally to as high as $1,400, driven by U.S. twin deficits and Chinese stimulus.